It is now well known that a cardiomyopathic state accompanies diabetes mellitus. Although insulin injections and conventional hypoglycemic drug therapy have been of invaluable help in reducing cardiac damage and dysfunction in diabetes, cardiac failure continues to be a common cause of death in the diabetic population. The use of alternative medicine to maintain health and treat a variety of diseases has achieved increasing popularity in recent years. The goal of alternative therapies in diabetic patients has been to lower circulating blood glucose levels and thereby treat diabetic complications. This paper will focus its discussion on the role of vanadium on diabetes and the associated cardiac dysfunction. Careful administration of a variety of forms of vanadium has produced impressive long-lasting control of blood glucose levels in both Type 1 and Type 2 diabetes in animals. This has been accompanied by, in many cases, a complete correction of the diabetic cardiomyopathy. 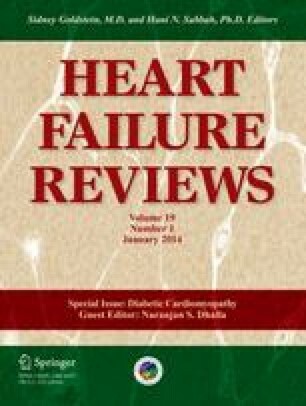 The oral delivery of vanadium as a vanadate salt in the presence of tea has produced particularly impressive hypoglycemic effects and a restoration of cardiac function. This intriguing approach to the treatment of diabetes and its complications, however, deserves further intense investigation prior to its use as a conventional therapy for diabetic complications due to the unknown long-term effects of vanadium accumulation in the heart and other organs of the body. This work was supported by a grant from the Heart and Stroke Foundation of Canada and through indirect support from St Boniface Hospital Foundation.